In the matter of Shidukhim --finding the future spouse-- the Shulchan Arukh (eben ha'ezer 2:2) writes that one should be mindful of certain red flags in the family of the prospective candidates. 1. It mentions that it is not a good sign if a family is always fighting within themselves or with another family. One should look for a spouse that comes from a peace-loving family. 3. Furthermore, the Shulchan Arukh identifies the genetic setup of a Jewish person with the following words: Jews are innately compassionate, shy, and actively kind (rachmanim, bayshanim, gomle chasadim). So ingrained are these character traits in a Jew that the Rabbis declared that whoever acts with cruelty towards others, or does not show sensitivity toward other's suffering or does not have a minimal dose of decency or displays a shameless behavior, might not be of a Jewish ascendence. Back to Shidukhim, the more identifiable these three virtues are in a candidate, the stronger the case for considering him or her a suitable partner, and vice versa. I dedicate today's HOTD to my son Abraham, who yesterday became a Paratrooper (tzanchan) in the IDF. (See here a clip of the Paratroopers ceremony in the Kotel). SHEMA ISRAEL: Pasuq # 5. Love for God in actions and thoughts. "And you shall bind them [the words which declare our love for God] for a sign upon your hand and they shall be as frontlets between your eyes". We are commanded to bind the words "And you shall love HaShem your God with all your heart and with all your soul and with all your might" upon our hands and between our eyes. This means that love for God must influence what we do with our hands--our actions--and what we think with our brains--our thoughts. This and the previous verse together (see here) teach us that our love for God must make us speak, do, and think what is right. This verse is the origin of the use of the Tefilin or phylacteries, which contain four sections of the Tora, which set forth all that is dear and holy for the Jewish people. They are worn, therefore, because of what they teach and because of their influence, when rightly understood, upon our conduct. Similarly the High Priest wore on his forehead the inscription "Holy to HaShem," to teach holiness as the ideal of human conduct. "Wearing" the Shema Israel as a frontlet thus becomes a reminder of right conduct through love of God. These ideas are conveyed in the words of the meditation which many Jews recite when about to wear Tefilin: "Through the influence of this command, the Tefilin, may we be blessed with sacred impulses and pure thoughts, with no desire for sin or iniquity. May evil imagination have no power to allure us and lead us astray, but may we be led to worship HaShem as it is in our hearts to do." Click here to read: "TEFILLIN: Everything you need to know about those powerful black boxes, placed on the head and arm" by Rabbi Shraga Simmons, from Aish. 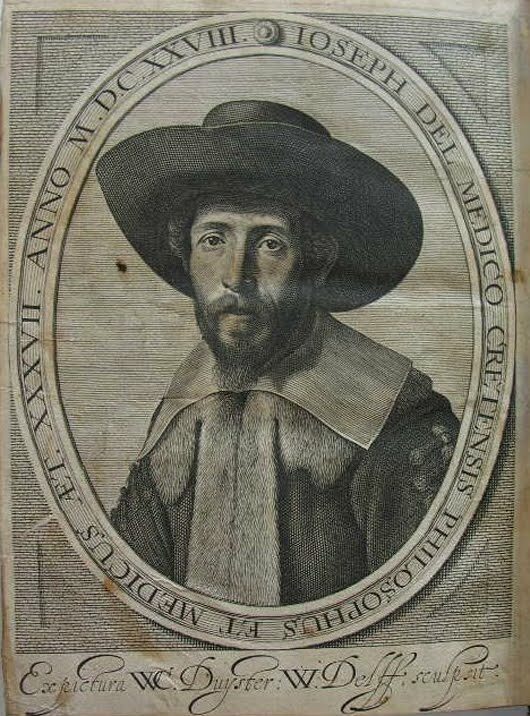 Yosef Delmedigo was born in Candia (Crete, Republic of Venice). He was a rabbi, philosopher, mathematician, physician and astronomer. The author of works whose number is estimated by some authorities at 30, by others at over 60. At the age of 15, he was admitted to the University of Padua, where he studied astronomy and mathematics under Galileo Galilei. He also studied medicine and at the same time continued with his Jewish studies. While at Padua, he frequently visited Rabbi Aryeh di Modena of the neighboring city of Venice, who, it appears, exercised a lasting influence on him. 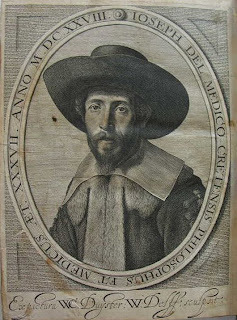 In 1613, he completed his studies at the University of Padua, and traveled to Crete, where he began to practice medicine. Rabbi Delmedigo visited to Cairo, where he became acquainted with Ali b. Rahmadan, a renowned Arab mathematician, whom he refuted in a public disputation concerning spherical trigonometry. Then he traveled to Constantinople and Poland. In 1620, he was practicing medicine in Vilna, as the private physician of Prince Radziwill, and had many nobles for his patients. During the week, he used to make the circuit of the environs of Vilna to cure the sick, and on Shabbath he would lecture in the synagogue. He was a pioneer in a number of aspects of scientific research. In astronomy, he espoused the Copernican system against the Ptolemaic system. He was the first Jewish scholar to use logarithmic tables, which had just been invented. He was a pioneer in empiric medicine. He spoke against the unsanitary conditions prevailing in the ghettos. Toward the end of his life, Delmedigo settled at Frankfurt on the Main, where he acted as the community physician. On his tombstone are written the words: "He practiced what he preached - he was just to everyone - the glorified rabbi, scholar, divine philosopher, and mighty one among physicians." One of his books, Elim, was first published by Menashe Ben Israel in Amsterdam 1629. The book is a response to religious and scientific questions (Tora umada') sent to Delmedigo by a Karaite Jew, Zerach ben Natan. The format of the book is taken from the number of 12 fountains and 70 palm trees at Elim in the Sinai Desert. Delmedigo divided his book into twelve major problems and seventy minor problems. The subjects discussed include astronomy, physics, mathematics, medicine, and music theory. In the area of music, for example, Delmedigo discusses the physics of music including string resonance, intervals, and their proportions, consonances and dissonances . In Elim and his other books, Rabbi Delmedigo also dealt with the first two books of Ptolemy's Almagest on astronomy, on astronomical instruments, on Kabbala and the supernatural, on algebra, on chemistry, on the aphorisms of Hippocrates on the opinion of the ancients concerning the substance of the heavens, on the astronomy of the ancients, who considered the motion of the higher spheres due to spirits (Delmedigo shows that their motion is similar to that of the earth), on the principles of religion, and mathematical paradoxes, etc. The name-giving of the daughter --known in Sephardic communities as Zebed haBat and in some Ashkenazi communities as Shabua haBat-- takes place usually during the first Shabbat or within the first month after the birth of a girl. As to the ceremony, there are many different traditions. I describe the ceremony according to Siddur bene tzion (there are no talmudic sources for it). 2. Before the prayer, the Chazan or the Rabbi recites a verse from Shir haShirim (The Song of Songs 2:14) praising the pristine beauty and the sweet voice of the baby girl. If she is the first girl to be born in the family, another verse (6:9) is added, describing her as a unique beautiful creature, the new Princess of the home. "He Who blessed our mothers Sara and Ribka, Rachel and Lea, the prophetess Miriam, Abigayil and Queen Esther, the daughter of Abichayil, may He bless this beloved girl and let her name in Am Israel be known as:... (here her Hebrew is pronounced and the name of her father: for example, "Rachel bat Abraham". In many communities they mention the name of the mother as well, i.e., Rachel bat Abraham and Sara...)... with good mazal and in a time of blessing. May she grow up with good health, peace and tranquility; and may her father and her mother merit to see her joy and her wedding, with sons, prosperity and honor; and may they be healthy and fresh, and live until an old age; and so may this be His will, and let us say, Amen!". 4. In many Sephardic communities the mother is also welcomed to say from her seat the thanksgiving blessing (Birkat haGomel) . I dedicate today's Halakha of the Day to my new grandchild, 'Michal', the daughter of David and Keren Bitton. She was born in Shanghai, China. Previously, we explained that God does not have a body or any resemblance to humans (see here). So different is God from us that we cannot even express with words anything about God himself on our own. We cannot say, for example "God is big" . Why? Because in our limited human language, the idea of 'big' might be used to refer to a 'big' cake, or a 'big' building, etc. How would we were to use that same word or idea referring to HaShem Almighty! HaShem's greatness is absolutely beyond our knowledge, our imagination and our ability to express it with words. According to Maimonides, then, we must use words "via negativa". We should not say, for example, 'God is a spirit', but we can say, 'God is not a body". There is one exception. In the Tefila (prayers) we do use words referring to God, but just to address God. When they composed the Amida (main prayer), the Rabbis also dealt with this question and they were hesitant to utilize any adjectives which will, so to speak, 'define', HaShem Almighty. "How could we dare to say about God, like Great, Powerfull, and Awesome (haGadol haGibbor vehaNora) ? Their answer was that we might say these words to address God, because Moshe Rabbenu used them in Perashat Debarim. So, we are just quoting the words of the Tora, without any pretension of understanding HaShem's greatness. When we dare to think of Hashem as if He is one of us, or as if we would know in our own what He thinks, or what He likes, we are just projecting our own small mind into an imaginary god. All that can be known about the God of Am Israel, is whatever He Himself wished to reveal in the Torah. It is through His Tora (Torah shebikhtab with Torah Shebe'al pe) that He communicated to us what His will is and how to address Him. READ "Steve Job's last words"